We all hate doing the ironing, don’t we? I dread to think how many hours a year are wasted in each household doing that dreadful task. Personally I’d rather spend my time on more important things or doing something that’s actually enjoyable. Well, if you follow my tips you’ll never have to do the ironing again! Before you start your wash make sure the washing machine’s spin setting isn’t set to the maximum. The higher the setting the more creased your clothes will come out. I normally have the spin speed set at 800. As soon as the cycle has finished, take your clothes out quickly and give them a good shake before hanging them out to dry. Once your clothes are dry, fold them up quickly and put them away. If you need your clothes quickly or if it’s raining, you can use the tumble drier (if you have one) although avoid it if you can as it’s not really environmentally friendly. If you do this make sure you pull the clothes out as soon as you can, give them a good shake and fold them up and put away. If you happen to have anything that does need ironing, just hang it up in the bathroom so that the steam from the shower makes the creases drop out. Magic! For even less creases you can always use an easy iron fabric softener in your wash and/or tumble drier sheets like Bounce in your drier. Also if you do insist on ironing it’ll make it easier and save you more time. 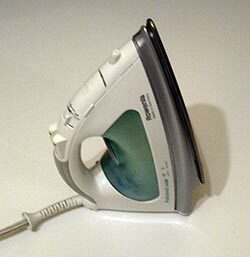 There’s also a spray you can use which makes ironing easier, just spray on to clothes and iron. On another note, when you next go clothes shopping look out for clothes with labels saying they are non-iron or easy iron. A lot of shirts and trousers these days are the non-iron type in particular kids school uniforms. Just think, no more standing for hours and no more back ache! Heaven!